Customize the layout of your forms using simple CSS attributes. Here at Wufoo HQ, we do our best to make it really easy to customize the look of your forms without having to dive into code. One of the ways we do that is with something we call CSS Keywords. They’re basically classnames that you can add to your fields and depending on the field and the keyword, will make them do a fancy trick like hide the seconds of a date field or turn a section break into a scrollable block Terms of Service block. The reason it works is because our team writes all the fancy CSS code so it’s just baked right into the Wufoo form and you can unlock the styles you need whenever you need them by adding one little word. 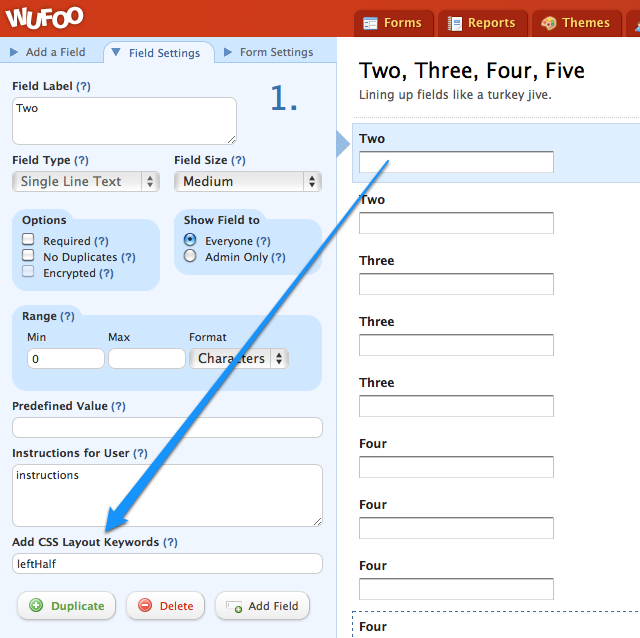 Some of the most popular keywords in Wufoo are used to change the layout of the fields so they can fit two or even three fields in a row. To help our users new to CSS Keywords, we’re going to show you in detail how to use these keywords to implement this pretty popular enhancement. We are also excited to announce that we’ve added a few new CSS keywords to allow you to arrange four and five fields to set next to each other side by side. Yay! Alright, let’s dive in. These keywords work on all fields except Likert Fields. You’ll also just need to test and use good judgement. For example, address fields should work well with leftHalf and rightHalf, but you probably won’t be able to get five of them next to each other. Also note that CSS Keywords are CaSe SeNSatiVE. That means for “leftHalf”, you need to use it just like that. “LeftHalf”, “lefthalf”, “LEFTHALF” will not work. We hope these new keywords are useful to you in building space-efficient forms to your aesthetic liking! For those that like to watch and learn, this video goes through all of our different CSS Keywords, including these arrangement keywords.